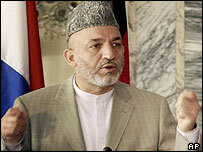 Afghanistan has introduced a new law on political parties, which bans armed factions from politics. The Justice Minister, Abdulrahim Karimi, said that political groups backed by armed forces would not be allowed to register under the new legislation which has not yet been published. Correspondents say this could exclude a number of powerful figures from the political process, including the Defence Minister, Mohammed Fahim, and powerful regional warlords. Reports say the new law also prohibits political parties which are against Islam, or which promote racial, religious or sectarian hatred and violence. A number of established political parties - including the former Communists - have been resisting government attempts to restrict their activities, arguing that until now there had been no law to regulate them. In December, a Loya Jirga (Grand Assembly) is due to adopt a new constitution. That will pave the way for elections due to be held next year. Afghanistan's only previous experience of national elections was a stage-managed affair in the 1960s, so the country is starting from scratch. It has been years since a population census has been carried out. Millions have been displaced by war and few people have identity documents of any sort. Then there are the logistical problems of reaching remote villages in an insecure, mountainous land with few good roads. The UN has been entrusted with the task of overseeing the registration process and the electoral commission will work closely with UN counterparts.